The second of January may be the worst possible day to have a birthday. Mr Snail, however, does his utmost to ensure that I have a good day and this year was no exception… a lovely lunch at The Harbourmaster and then an evening at home with a glass or two of something sparkling. Although we don’t do presents for Christmas/Yule/Chanukah, we do give each other birthday gifts. 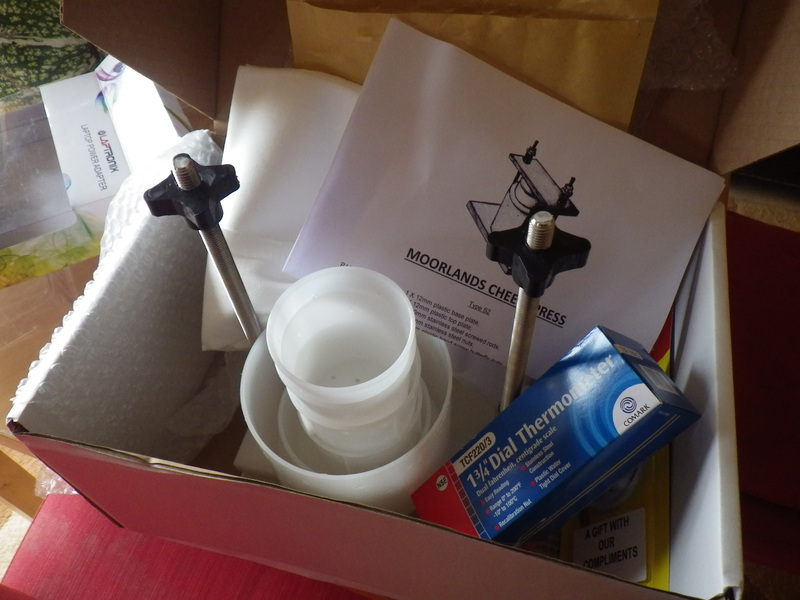 This year I asked for a cheese-making kit. I thought it might be a fun skill to acquire and it is something that I have never tried before. Proper cheese, especially the hard stuff, has relatively little lactose in it and so I am able to eat it in moderation. By tomorrow I may have three small soft cheeses … or I may just have a pile of curds and a bowl of whey… only time will tell. Anyway, thank you to Mr Snail for buying me such an interesting birthday present… I’ve never wanted perfume and flowers and it’s a good job he understands this! Now, I’d better work out what I can use all this whey for. What briilliant fun! My London childhood was punctuated by regular cheese-making – soft curd cheese only – because in those far-off fridge-free days, sour milk was a regular occurrence and throwing it away was unthinkable. I hope you’ll tell us all how the project develops. Now I have to work out what to use all the whey for! Not all look entirely practical….. Some good ideas… I managed to cook with some and then I fed the rest to the chickens yesterday mixed with their layers mash – they loved it! Whatever you use it for, be sure to remember that whey contains a lot of lactose. Lactase enzyme already in the whey for use tomorrow! Fantastic present! Looking forward to seeing the results. I’m not sure I dreamt this but I think someone said whey is really good for the body and that someone was soaking the hen food in it. My husband sometimes makes Paneer, very easy and very nice to fry instead of meat. Great ideas… I’ve also realised that I can make ricotta cheese out of it first. I think that the hens will be getting quite a bit of the left-overs too! Use fresh whey anywhere in the kitchen that you’d use water. Breadmaking, cooking pasta or rice, soup bases … you get the idea. One word of warning, if you give it to the dog in any quantity (who will love you for it if you do) be prepared for erm… explosive results. Happy Birthday belatedly… I agree that January and December birthdays are both fairly pants, but they seem to run in the family for both of us… My sister in Dorrigo makes cheese on a regular basis (ie, once a week) and she’d tell you that practice makes perfect. Her first attempts were dreadful, but now her cheese is definitely eatable and tasty. One word of advice if you progress to something more interesting than curd cheese; don’t wrap the cheese in greaseproof paper. It sticks. Use muslin instead. And the Girls will love a bit of whey, full of protein. When I first started making cheese I downloaded a huge list of uses for whey. It included recipes for making whey wine and whey beer. Now isn’t that something that could put you off alcohol for life? Huge Penblwydd Hapus wishes, though a little late. It sounds like you’ve had an interesting day with what might be a very successful day to come. I’ve got my fingers crossed for you. Jon couldn’t have chosen a better gift. Good luck with your cheese making! Can’t wait to see the photos of the final product. Belated Happy Birthday Wishes. What a great gift and a great way to start a new year with such an exciting challenge. Fingers crossed! Now, that’s a cool birthday present! I’ve read that making mozzarella is not too hard and was intrigued but have never gotten past that stage. Does your kit come with instructions for different kinds of cheeses? Just think–the possibilities are almost endless! What fun! Looking forward to seeing and hearing about the result…. and of course belated birthday wishes! The trouble with 2 January is that it is exactly the day when everyone is switching off from celebrations – no one wants to party, and many people are beginning a diet. When I still worked in an office I stopped taking in cake or biscuits for my birthday because having them rejected was just too depressing! These days, however, Mr Snail makes sure I have a good day and this year I’m hoping to repay him in cheese! !